We use candles on so many occasions. It just lights up the environment letting us enjoy the whole aesthetic vibes it creates around us. But sticking of candle wax on our dear furniture and beautiful clothes and all other types of surfaces, you never want that right? As much as the candlelit is soothing to us, our things to are dear to us. 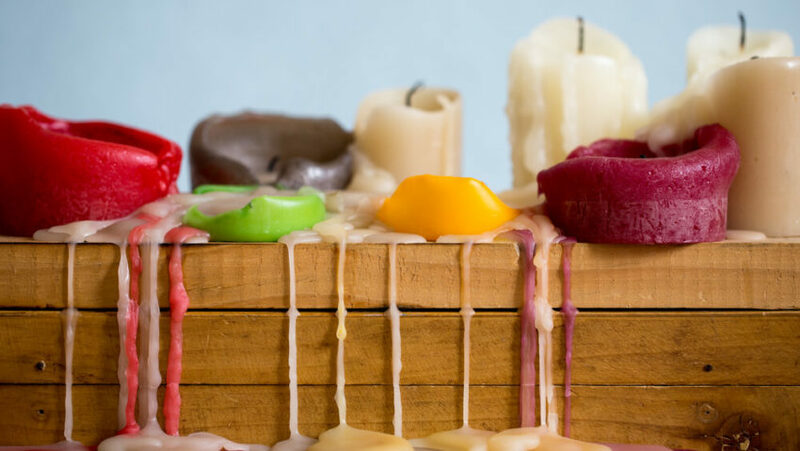 Rather than just brainstorming as to how you’ll get rid of these candle wax stains, just follow these methods and never sacrifice on lighting candles anytime. All you need is paper towel(blotting paper works equally well), Iron, Normal Towel and any washing powder/soap/liquid. Step one in this process is to do nothing. When I say this, I mean that the wax has spilled freshly, it is hot so it’s better to let it dry. Trying to get rid of it while it’s hot will rather spread the stain. After it has dried, try scratching the resulting hard component as much as you can by using a knife. After scratching, place a normal towel behind the stain. Put two paper towel above the stain and iron it between medium to low heat for the wax to melt. If the paper towel gets saturated, replace it or change its sides. If the stain is colored, use lukewarm water and an oxygen-based stain remover and let it soak (this step is only for colored stains). Finish the stain removal process by washing and drying the cloth. Tada! The stain is gone. Blow dryer, white vinegar, water, white cloth, and furniture polish. Soften dried wax with a blow dryer on medium heat. (Safety tip: Keep the blow dryer 3 to 4 inches away from the table and from your face too). After it melts, blot the softened wax with a soft white cloth. Pour some white vinegar over the remaining wax and wipe it with a cloth. In case the polish dulls out because of vinegar usage, use the furniture polish to make it look like it was. And here you are done removing wax from your wooden furniture or any other wooden surface. Related: Genius Vinegar Cleaning Tips for home. Materials Required: Steel Ruler or Knife, Textured Cloth. Try to scratch out as much wax as possible using a steel ruler or if that doesn’t work, use a knife. For the remaining wax, take a cloth with some solid texture, soak it in hot water, and then wipe it over the wax. This will easily remove any leftover wax. Materials Required: Ice Cubes, Plastic bag, Steel Ruler or Spoon, Vinegar, Baking Soda. On the spot of the wax, keep a plastic bag filled with ice cubes to harden the wax. Keep it for a few minutes. Cold treatment is used for vinyl floors because vinyl and heat aren’t that good friends. Remove the hardened wax using a ruler or spoon. Still, if any stain remains behind, use any multipurpose remover to wipe it out. Or you can try rubbing a paste of baking soda and vinegar over the stain to clean it. This is an efficient and cheap hack to clean the vinyl floor of any stains. Materials Required: Plastic Ruler, Warm water, Soap. To remove wax from glass, use the same method as used for other surfaces, i.e. to scratch away the hard dried wax. For glass, use a plastic ruler. Clean the remaining wax and stain with lukewarm soapy water. Warm water will soften the wax, facilitating easy cleaning. Materials Required: Hair Dryer, Water, Vinegar. Use the hair dryer at medium heat to melt the wax. After it melts away, wipe it off with lukewarm water. Remove the residual stain with a solution of 1/4 cup vinegar to 3/4 cup water. Materials Required: Sharp Object, Lint-free cloth, Iron, Rubbing Alcohol, Vacuum. A sharp object, lint-free cloth, iron, rubbing alcohol or ethanol-based liquid. Using any sharp object (not very sharp which can harm your product) scratch the hard wax. Take a little wet, lint-free cloth and lay it over the wax. Iron the damp cloth with a medium temperature setting; the wax will stick to the cloth. Apply rubbing alcohol to remove residue. If rubbing alcohol is not available, use an ice pack to freeze the wax. Then scrap the frozen wax with a blunt object, like the handle of a kitchen utensil. Vacuum up the pieces before they soften. Use the dryer to warm and melt the wax but be very careful so you don’t burn the leather. Remove the wax with a clean cloth, and then use a little wet cloth soaked in mild soapy water to remove residue and keep the leather from drying out. Safety tip: Be very cautious while using heat and sharp objects. Keep them away from your face and body while using. Don’t leave it around children. Be very sure about the material on which the wax has split and only then use the most relevant method as that would not harm your product. If we missed something, let us know in the comments below!